I like making things with my heart, hands & brain. The low stickiness of the the low tack tape is designed so you can transfer cut vinyl decals from one surface to another. And it comes in extremely wide rolls that work well for large panels (A3+ etc) if you're doing large engravings or cuts. I stick the stuff on, and then roll over it with a rubber roller (typically used by printmakers) to remove the wrinkles and ensure a even consistent surface to engrave/cut. Works really well, and is easy to remove. If you want to experiment on a budget, try using some white or green painter's masking tape on your plywood. With painter's tape, you just have to be very careful not to overlap (so that the tape is double in height), or leave gaps - that way you'll get a consistent surface to prevent charring. Some folk on the forum feel that blue tape works less well. I haven't tried. I've never had transfer tape or painter's tape catch on fire, compared to wood surfaces (or worse - painted wood surfaces.) But I have always had air assist, and aim not to overburn a surface with too slow a feed rate. I have had zero success with blue painters tape. Good results with brown. Ok, I was so curious that I found a can of compressed air and was blowing it constantly while cutting. 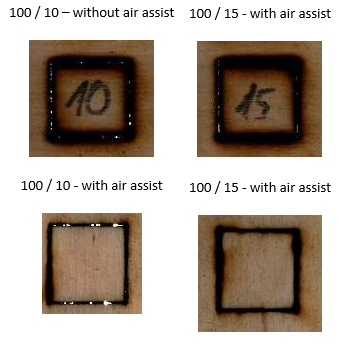 So air assist is indeed helping with burnt edges but it does not affect the cutting abilities at all.... same number of passes - same results but less burnt. Hey Oscyp. What is your wood sitting on? if it is sitting on a flat surface, try raising it so only air is under the cut. It helps the finish the cut by letting smoke escape. @ianchia I'll try the trick with a painter tape today, I think I had one that is 5cm wide - it will be enough for testing. Ok I did a test with a paper tape. The last square just felt off. The rest - did not. After using some force - the middle 2 squares also came out. I think the primary purpose of the tape is to help keep the soot off the surface of the uncut wood. I'm assuming that 100/15 is 15 passes at a speed of 100mm/min. What power laser do you have? What is the approximate distance from lense to work? yes 100/15 means speed 100 and 15 passes. We have similar setups but you seem to have a wider kerf and more char. Do you notice any difference between the X & y cuts? Particularity and angle on two sides. Yes I notice something like this on some engravings. Unfortunately I have to focus the laser beam manually all the time. (I mean when changing the material). I'll do some tests later on today to show you. An angle that is cone shaped on all sides is due to the focus beam. Wider on either X or Y is due to the rectangular bean pattern. Slanted in the same direction for both X or both Y is the laser module is not vertical. Just my observations!! !